Wondering why you are attracted to Wrong Fits in both your professional and personal life? Then listen to Dr. Arlene's WIN Without Competing! show featured on BlogTalkRadio. Radio personality and creator of the Right Fit Method, Dr. Arlene Barro, is your expert advisor who shares her insight, advice and wisdom to help you achieve professional and personal success. The goal is to learn how to carefully craft blueprints, to reduce the risk of making mistakes: wrong job, wrong career, wrong spouse, wrong house, etc. If you have made a mistake, then let's fix it. If you can't fix it, let's close the door, at the right time. Before proceeding to open new doors, let's work on those blueprints! While you are mastering how to write blueprints to find the Right Fit job, start learning Dr. Arlene's unique interview strategies to get that job offer right now. Are you having difficulty finding and keeping a job? Visualize a new set of strategies called the Right Fit Method, created by Dr. Arlene, which you must implement to succeed in your career. Start listening now to Dr. Arlene's radio show. On WIN Without Competing! Dr. Arlene wants to find out your Interview Strategy IQ by giving you her ISIQ Quiz. Then, she will reveal her unique interview strategies that work. Constantly teaching these strategies on the radio show, to coaching clients, and at seminars, Dr. Arlene continues to create more interview techniques for her toolbox to help you. Why? A job interview is a highly complex interaction. To succeed, you must master her interview strategies to convince the employers to HIRE YOU. Curious? Be sure to read Dr. Arlene’s newsletter and sign up. Persuade Decision-Makers(DM) to HIRE YOU. On WIN Without Competing! 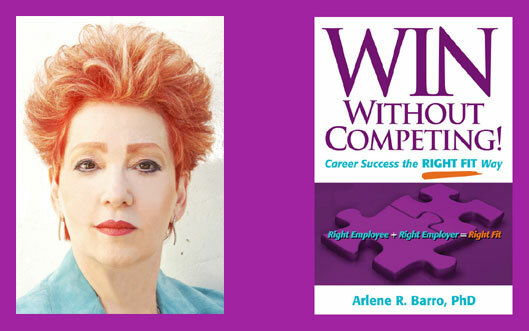 Dr. Arlene will reveal what YOU need to do to Persuade Decision-Makers to HIRE YOU. Wouldn't it be wonderful to know how to dazzle employers and receive multiple offers? The key is your DMIQ. Take Dr. Arlene's DMIQ Quiz and discover your DMIQ. You need a high DMIQ to capture the position that YOU want. You can do it, if you are ready to change your behavior right now. Dr. Arlene will tell you how. It's all up to YOU! On WIN Without Competing! Dr. Arlene will talk about the impact of picking powerful words that work to achieve specific objectives. Do YOU want a job offer? Then, imagine achieving your dream using Dr. Arlene’s powerful words that work. Tune in and make those words YOURS. Then, visualize the results and proceed! Not sure how to do this? Talk to ME! Call Dr. Arlene at 310-443-4277. Oops, I have no brand! On WIN Without Competing!, Dr. Arlene will talk about the tools of branding individuals and businesses. Many make the erroneous assumption that professionally prepared resumes, bios, and videos present their brand. Not necessarily so. If you have a business website, do not assume that offering discounts and coupons will display your brand. The 99 Cent Store is the exception, of course. To succeed in your job search or business, YOU need a brand that clearly differentiates YOU from others. Wouldn’t it be wonderful to present yourself as ONE of a kind? Yes, it’s possible. Tune in to learn how. and Career Strategy for 2012! On WIN Without Competing! Dr. Arlene will unveil the number ONE business and career strategy for 2012, which you must implement immediately to achieve career success. Dr. Arlene, with her co-host Michael Yurchak, Award-Winning Actor and Voice Over Artist will inspire, motivate, and energize YOU to take charge of yourself. Never feel stuck again! * "Invaluable Solutions: Ten Career Commandments for 2011"
* "Storyteller Stars from WIN Without Competing! Propelled by Passion: Grace Tiscareno-Sato and Dr. Helen Hurst"
* "Warren Buffett, Oprah Winfrey, and Donald Trump are Memorable. Are You?" * "Presidents Obama, Bush and Clinton Speak Up and Say What. And What About You?" * "The Ten Communication Commandments that will change your Professional and Personal Life"
* "Michael Yurchak: Plays Dennis Mitchell on Mad Men and Buddy the Elf on It's Always Sunny in Philadelphia"
* "Remember Steve Jobs, When Searching for a Job"
* "Jumpstart your Job Search to Succeed"
* "The Right Fit Method Gets Personal: What is your Personal Assumptions Quotient (PAQ)?" * "A Conversation/The Veil of Email: What is Your Email Assumptions Quotient (EAQ)?" * "The Right Fit Method Gets Even More Personal: What is your Secret Assumptions Quotient (SAQ)?" * "Dr. Arlene probes the Relationship Between Passion and Risk: What is Your Core Identity Passion/Risk Assumptions Quotient (CIPRAQ)?" * "Phil Boyce: President, Talk Radio Network (TRN) Syndications and President of Programming, TRN"
* "Humanitarian Shayna Turk: Winner of Young Entrepreneur Award and Scholarship"
* "The Anne Edwards Brand of Celebrity Biography"
* "Dr. Julianne Malveaux: President, Bennett College for Women"
* "Sherrilyn Kenyon: The Reigning Queen of the Vampire Novel"
* "Billy Lowe: Celebrity Hairstylist and Beauty Expert"
* "Judy Lamppu: Producer, Screenwriter, Lyricist, Singer and Ms. Senior Santa Clara"
* "Independent Filmmaker Suzanne DeLaurentiis: Head, Suzanne DeLaurentiis Productions"
* "Rachel Brill: Superstar on the Rise"
* "Dennis Meredith: King of Scientific Communications"
* "Mary Beth Garber: President of the Southern California Broadcasters Association"
To listen to past and upcoming shows, click here!